There are people you like, public and private, not because you agree with them particularly, but because you’re both against the same things. That’s kind of how I feel about Stand Firm: Resisting the Self-Improvement Craze, by Danish author Svend Brinkmann. Brinkmann argues that this whole modern self-improvement thing, with all its books and seminars and courses, has resulted not in greater happiness, but in greater frustration, because we’re never “improved enough,” and we’re constantly made to feel guilty about our many failures to “live in the moment,” “think positively,” etc. 1. Cut out the navel-gazing. 2. Focus on the negative in your life. 3. Put on your No hat. 6. Read a novel – not a self-help book or biography. That reads as parody, and in fact the book is often funny. But there’s a serious point too. What Brinkmann calls “liquid modernity” – the “flexible” approach to life that the self-help gurus require – is murderous to the soul. We need a place to stand. That requires some negative thinking and a focus on our duties to others rather than just to ourselves. We live in community with others, and we often need to deny our own “needs” in order to maintain our relationships. I found it interesting that Brinkmann appealed to Stoic philosophy rather than to Christianity in his quest for a backward-looking discipline through which to resist liquid modernity. It reminded me of Tom Wolfe’s A Man in Full, which also looked to Stoicism for a similar purpose. I don’t know whether this choice reflects an unthinking modern prejudice against the riches of Christian thought, or just a (probably well-founded) assumption that if you talk about Christianity, people today won’t listen to you. I think the book is diminished by the choice, but I can’t argue that my way would improve sales. 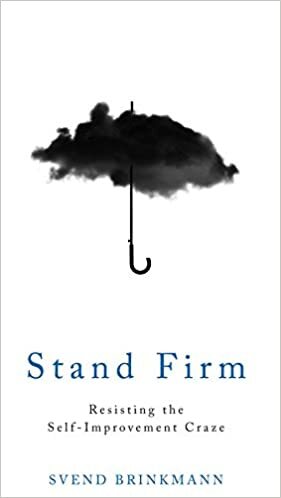 I don’t agree with all the guidelines recommended in Stand Firm, but I enjoyed reading it and consider it a tonic for our times. And the English translation is first-rate. Recommended.